I was a Dr. Spock baby. My mother cared for me “by the book” the famous Baby and Child Care. She proudly gave me her much used copy when my first child was born. I paged through it with growing bemusement (Spock’s methodology was contrary to everything I wanted to be as a mother) because I had already prepped myself on Dr. Brazelton’s Infant and Mothers and What Every Baby Knows. These books, in setting out Dr. Brazelton’s observations and advice, debunked much of Spock’s regimen. In preparation for writing this review I took a sampling of younger mothers (those mainly in their thirties), some had heard of Dr. Brazelton but many now utilized and relied on other childcare gurus. Such is the importance of Dr. Brazelton’s work that this sensitive memoir fills a gap as to the theoretical and practical roots of contemporary child raising practice. 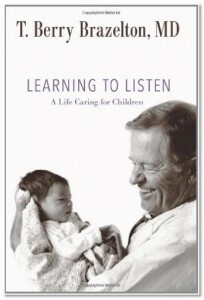 Learning to Listen is a timely reminder (on Brazelton’s 95th birthday) of his huge contribution to child rearing. Dr. Brazelton details and pays tribute to the many colleagues he listened to and cooperated with and to whom he owes a debt for the theory and practice he then shared with hundreds of pediatricians and scores of thousands of patients. Most importantly Dr. Brazelton listened, observed and learned from babies. Newborns have a special place in his heart and the chapter on “Discovering the Power of Newborns” rivets attention, especially the section on how the Neonatal Behavioral Assessment Scale (NBAS) was developed from the work of Heinz Prechtl. The scale became know as the Brazelton scale. It is fundamental to Brazelton’s understanding of how to give parents insight into their baby. In other sections Dr. Brazelton writes of the development of his widely (and wildly) influential four point, Touchpoints model, positing in child rearing instead of a stimuli-response model the family becomes a system in which each member is in balance with the other members. He also explains his advocacy for children on the national political stage during the years of the Clinton administration’s foray into the health care debate. The opening chapters lay a strong foundation for understanding the influences on Dr. Brazelton’s life. They relate his childhood in Waco, Texas, his college experience at Princeton, and the early days of his medical training and residencies in Boston—a compassionate glimpse at the young boy and man who became such an internationally trusted pediatrician. He unsparingly denotes his emotional struggles with his father and younger brother juxtaposed with his love for his mother, as well as for an older black woman, Annie May, his nanny. Later, gradually, he found his place in the thriving Boston medical universe and began to be noticed by leaders in the field of pediatrics. A singular contribution to the memoir is Dr. Brazelton’s account of his research with newborns in other cultures. For years he asked many questions of himself as to similarities and differences in newborns in various cultures—genes, nutrition, experiences in utero, and delivery. Availing himself of any opportunity, over decades he visited and worked with babies and parents in Southern Mexico (Mayan culture), Guatemala, Kenya, Japan, China, and in New Mexico among the Navajos. He is still dispensing well-researched and hard won practical advice. Dr. Brazelton’s Learning to Listen is a must-read for professionals and lay people alike—anyone interested in babies and in parenting.